Greetings. This is the New York Rare Bird Alert for Friday, April 29th, at 7:00pm. The highlights of today's tape are SWALLOW-TAILED KITE, WHITE IBIS, VARIED THRUSH, YELLOW-THROATED and PROTHONOTARY WARBLERS, SUMMER TANAGER, BLUE GROSBEAK, and lots of spring migrants. A decent weekend and good early season influx of birds Monday and Tuesday was followed by decreasing numbers Wednesday and Thursday, but a refreshing movement today into some city parks. Local breeders are already settling into their territories, but many more migrants are due. Two nice rarities appeared recently on Monday. This year's winner of the "Who will be the single lucky person to spot the SWALLOW-TAILED KITE?" contest happened to be near field 2 at Robert Moses State Park Monday when a kite flew by, headed west over the dunes. Searchers along the Jones strip could not relocate it later in the day. Then Monday afternoon an adult WHITE IBIS was spotted flying into Mount Loretto Preserve off Hylan Boulevard on Staten Island. Those arriving there before dark got to enjoy the ibis, but it was not seen thereafter. 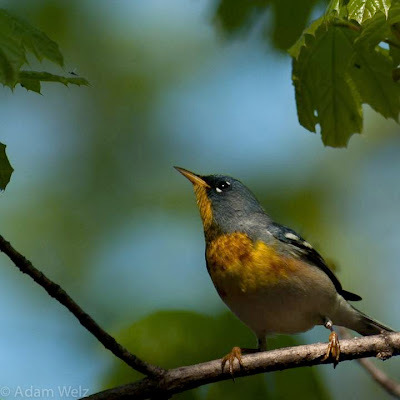 The Central Park VARIED THRUSH was still around the 79th Street park transverse up to Tuesday, but may have departed. 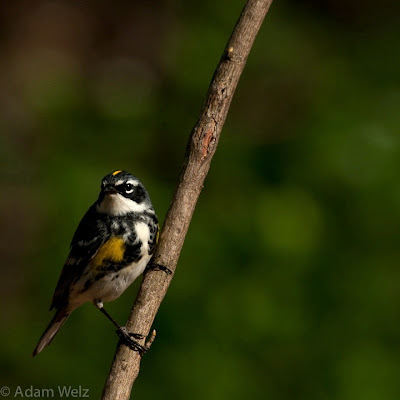 More attention was paid to the YELLOW-THROATED WARBLER first spotted Monday near Turtle Pond, and noted Thursday near the northwestern side of the Lake called the Upper Lobe. A good variety of warblers in Central early in the week and today featured an ORANGE-CROWNED WARBLER Tuesday, plus BLUE-WINGED WARBLER, NASHVILLE WARBLER, NORTHERN PARULA, CHESTNUT-SIDED WARBLER, MAGNOLIA WARBLER, CAPE MAY WARBLER, BLACK-THROATED BLUE WARBLER, BLACK-THROATED GREEN WARBLER, BLACKBURNIAN WARBLER, PRAIRIE WARBLER, BAY-BREASTED WARBLER today, BLACKPOLL WARBLER, AMERICAN REDSTART, WORM-EATING WARBLER, HOODED WARBLER, and CANADA WARBLER. Among other arrivals noted in Central and other parks recently have been GREEN HERON, SOLITARY SANDPIPER, RUBY-THROATED HUMMINGBIRD, EASTERN KINGBIRD, GREAT CRESTED FLYCATCHER, WHITE-EYED VIREO, YELLOW-THROATED VIREO, WARBLING VIREO, and RED-EYED VIREO, HOUSE WREN, VEERY, SWAINSON'S THRUSH, WOOD THRUSH, BROWN THRASHER, SCARLET TANAGER, ROSE-BREASTED GROSBEAK, INDIGO BUNTING, ORCHARD ORIOLE, and BALTIMORE ORIOLE. More unexpected in Central Park was a SEASIDE SPARROW up at the north end on Thursday; this sparrow could not be relocated today, but a singing CERULEAN WARBLER was present in the Ramble today. Look for the RED-HEADED WOODPECKER south of the Sheep Meadow. Prospect Park also had an exciting week, with many of the above species noted, plus BLACK-BILLED CUCKOO and YELLOW-BILLED CUCKOO today. 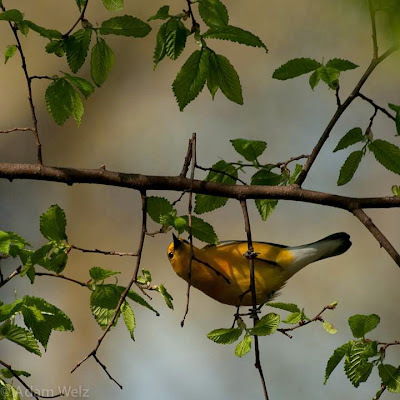 Warbler highlights there have included a PROTHONOTARY WARBLER from last Sunday, with at least two on Tuesday, one continuing to today at the compost pile near the Tunnel Arch, and two TENNESSEE WARBLERS and a CAPE MAY WARBLER today. A SUMMER TANAGER was also at the Vale of Cashmere on Wednesday. In Queens, an immature male BLUE GROSBEAK was at Lutheran Cemetery on Tuesday and Wednesday, while a female CERULEAN WARBLER was identified at Hempstead Lake State Park on Wednesday. 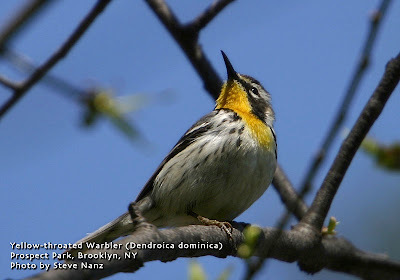 At Clove Lakes Park on Staten Island, the previously reported YELLOW-THROATED WARBLER was present at least to Tuesday, along with a nice assortment of migrants including an ORANGE-CROWNED WARBLER Sunday. To fill in the impressive number of YELLOW-THROATED WARBLERS appearing this spring, one was seen again Sunday at Connetquot River State Park, below the fish hatchery. Another on Sunday was found at the Graves Estate in East Hampton, and back on the 19th a YELLOW-THROATED was at Larchmont Reservoir in Westchester County. A HOODED WARBLER was at Southards Pond in Babylon on Monday. 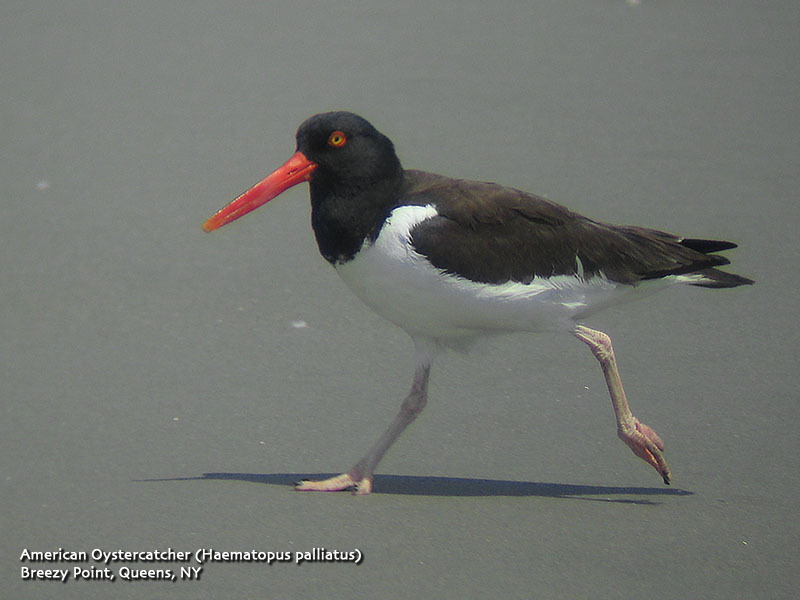 Three BLACK SKIMMERS appeared in Brooklyn Thursday, and last Sunday a GULL-BILLED TERN appeared at Jones Beach West End, and two were seen hunting in the dunes there today. An immature ICELAND GULL was at West End field 2 on Sunday, with four SEMIPALMATED PLOVERS in the swale there. A young male SUMMER TANAGER was found Sunday at Sterling Lake in Greenport, on the North Fork, and another PROTHONOTARY WARBLER appeared at Arshamomaque Preserve in Southold last Saturday. WHIP-POOR-WILLS have been heard since last Friday in appropriate eastern Long Island habitats. A Southampton sea watch last Saturday morning noted one SOOTY SHEARWATER and five RAZORBILLS, and single CASPIAN TERNS were at Mecox Bay and Sag Pond. Three LEAST SANDPIPERS were also there, and a SHORT-BILLED DOWITCHER was at Sag on Monday. 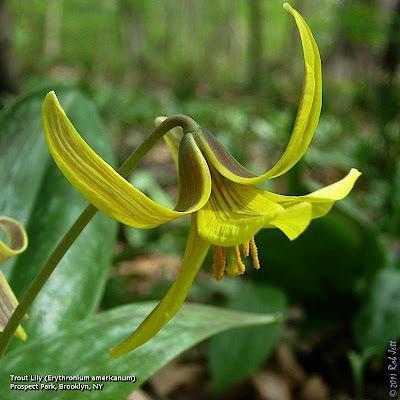 One of my favorite Spring wildflowers is the Trout Lily. Named for its green, mottled leaves which are reminiscent of the Brook Trout, I photographed this flower in a small hidden section of woods in Brooklyn's Prospect Park. Birdwatchers have only confirmed a handful of great horned owl nesting pairs around the city. A baby owl in Queens got her first lesson in sibling rivalry the hard way. The tiny fluff ball, who had toppled from a treetop nest at Alley Pond Park earlier last week, was returned to her home Friday by rescuers - but then promptly pushed out. "She was in there about five seconds when the sibling knocked her out," said wildlife rehabilitator Bobby Horvath, who caught the owl in midair while standing on a ladder. "I replaced her [again], and they seemed to tolerate each other. Sometimes with two babies in a nest, it gets crowded in there." 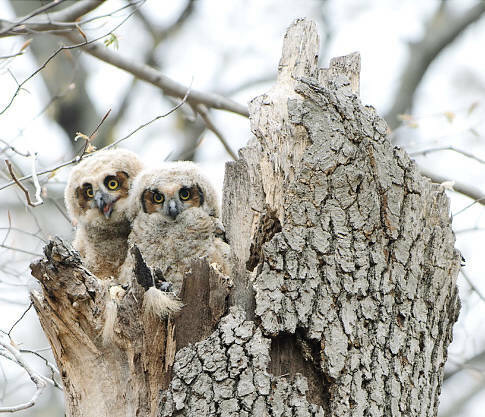 Alert birdwatchers found the wet, shivering 3-week-old great horned owl under a tree Wednesday and contacted parks officials. It's a scene that animal experts expect will play out across the city this spring as baby birds and other wild critters venture out for the first time. But Sarah Aucoin, director of the Urban Park Rangers, urged good Samaritans to leave family reunions to the experts. "The best thing to do is watch from a distance and call 311 for the rangers," she said. "The parents might be there just waiting for the public to leave." In this case, city parks workers contacted Horvath, who brought the owl to a veterinarian for an exam. Luckily, it had no injuries. Firefighters from Ladder 160 helped Horvath reach the 30-foot-high nest, while the mother owl kept a watchful eye from a nearby tree. "This is a rarity," said Horvath. "Usually the nests are higher up or not easily accessible." 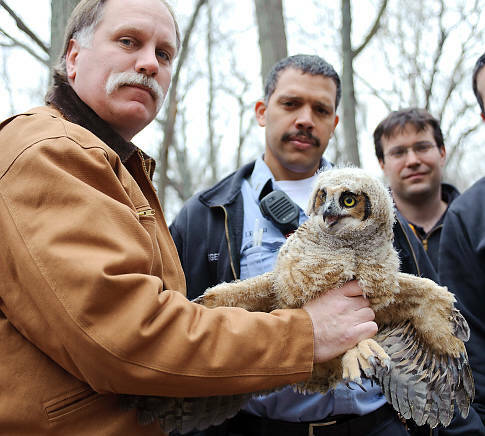 Parks Commissioner Adrian Benepe praised the collaboration of citizens and city workers that led to the owl's rescue. "It reminds us of how humans and animals share and benefit from the parks of New York City," he said. While screech owls and barn owls are commonly seen across the city, birdwatchers have only confirmed a handful of great horned owl nesting pairs. Horvath said he is raising several baby owls at his Long Island home that couldn't be placed back into their nests, but said his goal is to return the babies whenever possible. "Mother bird can do a much better job," he said. Wildlife rehabilitator Bobby Horvath with FDNY members (Bryan Pace for News). In addition to the avian migrants appearing in Brooklyn parks over the last week, I've also noticed an increase in butterflies and moths. While at Floyd Bennett Field, this Bumblebee Moth (Hemaris diffinis) was spotted feeding on the nectar of dandelion flowers. Up to that point, I'd only ever seen the related Hummingbird Moth (Hemaris thysbe). Both are of the "clearwing" family because, unlike other butterflies and moths, they loose the scales on their wings, which is what produces the colors. Within the last week magnolias have reached peak bloom and begun dropping their thick, fragrant petals. 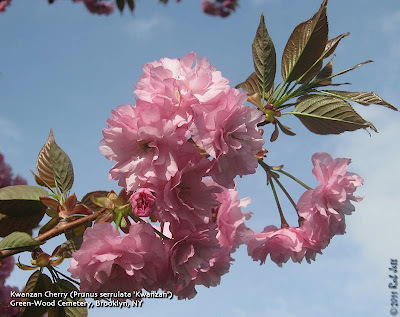 Kwanzan Cherry trees, however, have just reached peak bloom. In the avian world, New York City has just experienced its first big wave of northbound migrants. Beginning at the end of last week and extending into early this week, birders were treated to a display of colors and sounds missing since Spring 2010. I hadn't expected to see a big surge in songbird abundance and diversity, so Heydi and I went to Plum Beach to look for shorebirds on Sunday morning. From there we headed over to Floyd Bennett Field to check the runway puddles for sandpipers or plovers. While there, we received a text message that a Prothonotary Warbler was spotted in Prospect Park. Like the Yellow-throated Warbler that I wrote about a couple of weeks ago, the Prothonotary Warbler is a southern species that occasionally strays too far north and into New York. A songbird of the swamps, this egg-yolk yellow bird is highly sought after in the Spring. We turned around and headed to Prospect Park. To make a long story short, we spent 4 hours searching for the Prothonotary Warbler that day and never found it. The good news is that there were lots and lots of other new birds around. A week earlier we had tallied 10 species of wood-warblers, with yellow-rumped and palm the most abundant. This week we added seven more: Blue-winged Warbler, Nashville Warbler, Northern Parula, Black-throated Blue Warbler, American Redstart, Prothonotary Warbler and Worm-eating Warbler. Yes, we eventually did locate the prothonotary later in the week, which is a good thing, because I think Heydi's head would have exploded if she hadn't. A few other new birds this week of the non-warbler variety (but no less beautiful) were Rose-breasted Grosbeak, Orchard Oriole and Baltimore Oriole. The full list is at the end of this posting. Getting back to the Prothonotary Warbler, both a male and female were found feeding on insects in an area just north of the Prospect Park Zoo. This small semi-wooded area is adjacent to the Dongan Oak monument and bounded by the zoo to the south and Flatbush Avenue to the east. The parks department recently cleared nearly all of the understory here and is using it for storing woodchips/compost. There is a perennial water source under the bridge next to it so this new, "improved" woodland has been attracting a really good number of birds. I think that the composting might have created a concentration of insects, the primary food source for warblers. On the morning that I finally got to see the prothonotary I noted 9 species of warbler in only 15 minutes. On an old map of the park I discovered that this spot is officially known as the "East Woods". Here's a link to a map if you are interested in checking it out (and you should). With strong winds and storms blowing through the area today, I expect many of the birds have moved out, but this weekend should mark the start of the next wave of migrants. 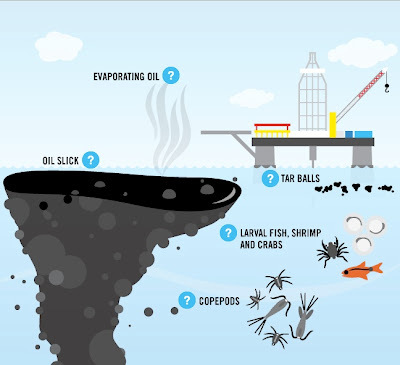 The Natural Resources Defense Council has put together an excellent interactive graphic that clearly (and chillingly) illustrates the ongoing effects of the BP Deep Horizon oil spill. NRDC explains: "Only eight percent of the approximately 170 million gallons of crude oil that flooded into the Gulf of Mexico was removed or burned. The rest was put into the environment; it dispersed or dissolved into the water column, floated to the surface, was deposited on the coast, or sank to the bottom." Saturday, April 30, 2011, 8 a.m. - 12 p.m. 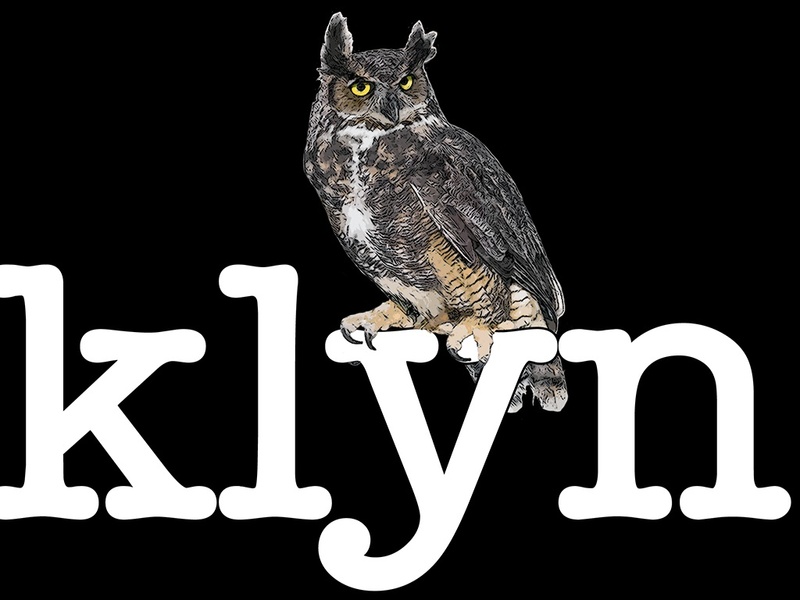 Discover how to identify common bird species in Brooklyn, then go on a naturalist-led tour to hone these skills. Central Park - "North and South"
Meet 7:30 AM at the park entrance at Central Park West Avenue and 103rd Street. The shifting dunes, classic salt marsh and extensive mudflats at Plumb Beach are dynamic, ever-changing maritime habitats for myriad seashore species. During early May, hundreds of native Beach Plums are in full blossom and put forth a spectacular display of pink and white. Explore this fascinating area with American Littoral Society naturalist Mickey Maxwell Cohen. Binoculars and a magnifying glass will be helpful. Guide: Gabriel Willow With Prospect Park Audubon Center Meet at the Grand Army Plaza Arch. May is Bike Month. To celebrate, get back on your bike! Tour Prospect Park, an Important Bird Area, and Green-Wood Cemetery, home to nesting parrots. A gentle ride of moderate distance with some hills. Bring binoculars, water, and your bicycle. Limited to 15. Prospect Park Alliance members, call NYC Audubon at 212-691-7483 to receive a member discount. $30 Click here to register! 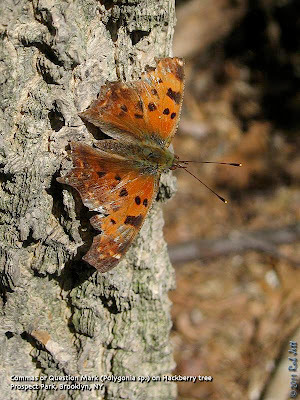 Sunday, May 1, 11:00 a.m. to 2 p.m.
Meet at the Nature Center at the intersection of Rockland and Brielle. We will follow the White Trail south to Nevada Avenue and back. Those interested in a shorter walk can meet us at 12:00 noon at the side of Meisner Road (toward the Eger Home) close to the intersection of Meisner and Rockland. Part 1 of this series focuses on Central Park's winged insects and then a search for them. Discover what lies behind the usually closed gates of the Hallet Nature Sanctuary. Greetings. This is the New York Rare Bird Alert for Friday, April 22nd, at 8:00pm. The highlights of today's tape are VARIED THRUSH, PROTHONOTARY WARBLER, YELLOW-THROATED WARBLER, ORANGE-CROWNED WARBLER, RED-HEADED WOODPECKER, SOOTY SHEARWATER, and spring migrants. Slowly but predictably, increasing numbers of migrants continue to appear, but the principal rarity remains Central Park's VARIED THRUSH. The thrush is now being seen mostly on the north side of the 79th Street park transverse, closer to the Metropolitan Museum of Art and Fifth Avenue than to the maintenance area that it had frequented for most of the winter. The RED-HEADED WOODPECKER also remains south of the Sheep Meadow around the 66th Street park transverse. Other Central Park highlights featured a second visit by the BOAT-TAILED GRACKLE near the Meer in the park's north end for most of Wednesday, and an ORANGE-CROWNED WARBLER reported Monday, while other arriving migrants have included CHIMNEY SWIFT, BANK SWALLOW, CLIFF SWALLOW, WOOD THRUSH, ORCHARD ORIOLE, BALTIMORE ORIOLE, ROSE-BREASTED GROSBEAK, and among the warblers, BLUE-WINGED WARBLER, NORTHERN PARULA, YELLOW WARBLER, BLACK-THROATED GREEN WARBLER, PRAIRIE WARBLER, a WORM-EATING WARBLER Thursday at the north end, OVENBIRD, LOUISIANA WATERTHRUSH, NORTHERN WATERTHRUSH, COMMON YELLOWTHROAT, and a HOODED WARBLER Thursday and Friday at the north end. In Brooklyn's Prospect Park a YELLOW-THROATED WARBLER was spotted again Monday at the Lullwater. Also in Prospect, a WORM-EATING WARBLER was noted Monday, while other noteworthy species have featured GREAT CRESTED FLYCATCHER, two RUSTY BLACKBIRDS, such warblers as BLUE-WINGED, NORTHERN PARULA, PRAIRIE, BLACK-THROATED GREEN, OVENBIRD, and NORTHERN and LOUISIANA WATERTHRUSHES. 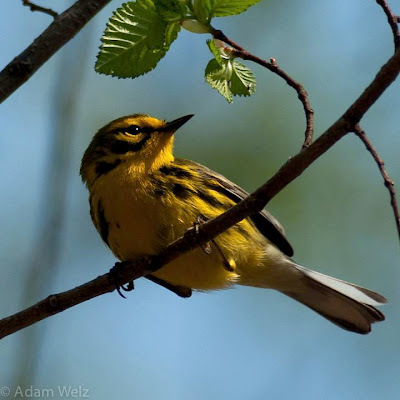 Two other YELLOW-THROATED WARBLERS were noted recently: one at Clove Lakes Park on Staten Island last Monday and then again today, and another today at Connetquot River State Park, just south of the fish hatchery. A male PROTHONOTARY WARBLER, found on the 14th at Twin Lakes in the New York Botanical Garden in the Bronx, was still feeding today along the edge of the small pond that is behind the administration building. A nice mix of migrants has also been present there. An ORANGE-CROWNED WARBLER lingering at Hempstead Lake State Park, was spotted last Sunday and again today, covering a good amount of territory around the lower end of the park. Unexpectedly early would be a GRAY-CHEEKED THRUSH reported Wednesday in Manhattan's Bryant Park, in company with some Hermit Thrushes, this an identification that needs to be done quite carefully at this point in the migration. At Jamaica Bay Wildlife Refuge, PECTORAL SANDPIPERS lingering along the south end of the West Pond reached five on Wednesday. LITTLE BLUE HERON, TRICOLORED HERON, and YELLOW-CROWNED NIGHT-HERONS are present in that area. On Sunday a white-winged looking gull, initially thought to be an Iceland, flew in much closer and was photographed on Terrapin Trail before it flew off, and its identification has not been established, perhaps an albino or hybrid. CLIFF SWALLOW has been occurring over the pond at the bay with other swallows recently. On Sunday a VESPER SPARROW was spotted at Sunken Meadow State Park, and a CASPIAN TERN visited Lotus Lake in Sayville. Farther east on Tuesday, EASTERN KINGBIRD and WILLET were noted along Dune Road, west of Shinnecock Inlet, where 30 COMMON EIDER are lingering. At Mecox Bay, two or three CASPIAN TERNS have been seen from Saturday through Tuesday, and another Caspian plus a LESSER BLACK-BACKED GULL were at Sag Pond on Tuesday. Two other adult LESSER BLACK-BACKED GULLS were at Mecox Bay on Saturday, when a PECTORAL SANDPIPER and five WILSON'S SNIPE were spotted at Georgica Pond. A sea watch off East Hampton Saturday afternoon produced an early SOOTY SHEARWATER and 527 NORTHERN GANNETS. A hawk watch at Hook Mountain in Rockland County Thursday recorded 712 BROAD-WINGED HAWKS. The Snowy Egret is one of the three usual white herons found around New York City (the other two being Great Egret and Cattle Egret). The quickest way to differentiate the snowy from the others is by its black legs and golden-yellow feet. Keep track of the northbound movement of birds through David La Puma's excellent "Woodcreeper" site. David studies Doppler radar images to follow flocks of migratory birds over New Jersey and summarizes his findings on his website. You can read more about his work here. Within the last week there has been an acceleration of plant growth, as well as, the appearance of more butterflies and other species of insects. This annual cycle is perfectly timed with the arrival of migratory birds. Some of these birds will stay in New York City and raise a family. The vast majority will continue northward, to breeding grounds within Canada's boreal forests, the arctic tundra or various habitats in between. The climax of bird migration is still a few weeks away, but the increase in species diversity and abundance over the last week has been profound. On April 10th I observed 45 species of birds in Prospect Park. Yesterday that number jumped to 64 species. Last Saturday I lead a Brooklyn Bird Club trip to Green-Wood Cemetery. It is a good time of year to look for migrating raptors and the cemetery has a few excellent vantage points along the terminal moraine for scanning the sky. Unfortunately, the weather didn't cooperate and there were fierce winds blowing in from the north. In fact, early on in the trip we watched a frustrated Common Loon struggling as it attempted to fly north. The bird eventually turned around and headed back south. Rather than waste everyone's time scanning for non-existent migrating hawks, I decided to lead the group on a songbird walk. Northern Flickers were seen in good numbers, as well as, a few other Spring migrants. We tallied Blue-gray Gnatcatcher, Golden-crowned Kinglet, Yellow-rumped Warbler, Pine Warbler and Palm Warbler. At the edge of the Crescent Water, below Samuel Morse's monument, we watched a Common Yellowthroat foraging for insects in a very curious manner. The pond is surrounded by a low, stone coping wall. 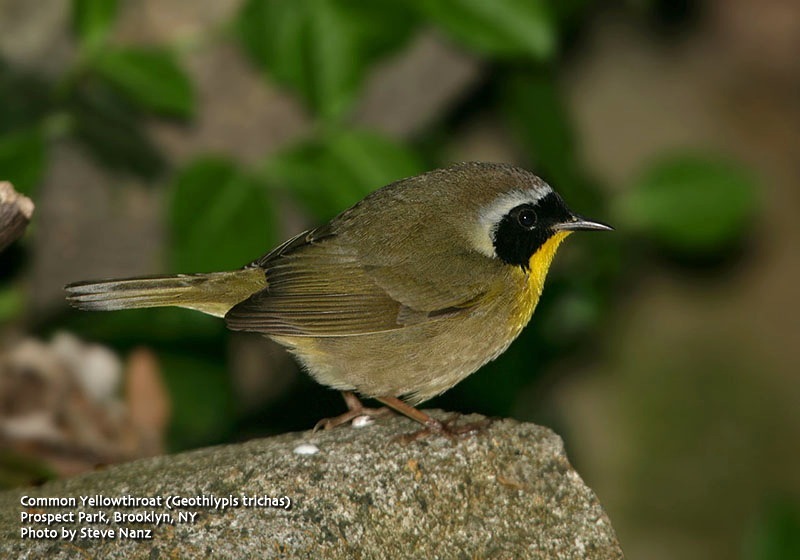 The yellowthroat was clinging to the wall's vertical interior above the water while picking insects from small cracks and crevices in its surface. He looked more like a nuthatch or creeper than a warbler. Heydi and I have volunteered to help the New York City Audubon Society with their annual shorebird survey. Shorebirds are just beginning to migrate through NYC, so we decided that Plum Beach, with its extensive flats at low-tide, would be a good Brooklyn location to monitor. We went early Sunday morning despite the fact that it would be high-tide (low-tide was at 1am), hoping to find some new migrants. Strong winds off of the ocean and a storm system moving up the coast raised the tide to the highest I've ever seen at Plum. The internal marsh habitat was completely flooded, looking more like a lake than a wetland. Several oystercatchers were noisily flying back and forth across the dunes looking for dry land. They were the only shorebirds we encountered. The strong wind and extreme high-tide had also pushed a few Surf Scoters very close to the shore, but most birds that morning were few and far between. We didn't fare very well at Floyd Bennett Field or Marine Park, either. It was just too windy for birds. I finally got my first real taste of Spring migration in Prospect Park yesterday. There were lots of Yellow-rumped Warblers and Palm Warblers foraging in the treetops and on the ground. In addition, Blue-gray Gnatcatchers suddenly seem to be everywhere, hyperactively probing the flowering trees for insects. The first Yellow Warblers have appeared in the park with several seen along the edges of the waterways. A single Prairie Warbler was singing his buzzy, ascending scale from a perch at the edge of Prospect Lake near Three Sisters. < /embed> A short distance from the warbler, I flushed my season's first Spotted Sandpiper as it teetered along the lake's crumbling coping wall. In all, I tallied 7 species of warbler in the park. Meteorologists are forecasting south winds on Friday and Saturday, so I expect that there will be a very good showing of new birds over the weekend ... rain or shine. So get on your rain gear and get into the parks! As of this past weekend all but one of our four Brooklyn Red-tailed Hawks are still on nests. The new pair that appeared in Prospect Park this Spring next to the skating rink appears to have abandoned their nest. It's impossible to know if their reason for leaving was the ongoing (and very noisy) demolition of the rink below them or pressure from the other four resident Red-tailed Hawks, either way, they've definitely moved on. Registration opens Monday 4/11. Ride: $20. Join with members of many environmental organizations and agencies including American Littoral Society, NYC Audubon, NYC Sierra Club, National Park Service, NYC Dept. of Environmental Protection at a marsh site along the shoreline of Jamaica Bay. Monday, Tuesday, Wednesday, and Saturday mornings in Central Park, Saturday, April 2 – Wednesday, June 1 Join Starr Saphir for bird watching in Central Park. On Mondays and Wednesdays, meet at 7:30am sharp at 81st and Central Park West (SE corner). On Tuesdays, meet at 9am sharp at 103rd and Central Park West (parkside). On Saturdays, meet at 7:30am sharp at 103rd and Central Park West (parkside). All Starr Trips are non-smoking. No registration necessary. Guide: Gabriel Willow With Prospect Park Audubon Center The first of a series of three trips to NYC’s best birding hot spots: Central Park, Prospect Park, and Jamaica Bay NWR. These three Important Bird Areas host an abundance of songbirds, shorebirds, raptors, and waterfowl. Come see the best nature the city has to offer! Limited to 20. Prospect Park Alliance members, call NYC Audubon at 212-691-7483 to receive a member discount. $55 for series of three trips. Saturday, April 23, 1:00 p.m. to 3:00 p.m.
We'll follow the multi-use trail overlooking Fresh Kills, pass the famous Hessian Spring as it crosses the path and view Fresh Kills estuary and work our way to the remains of Ketchum’s Mill. Along the way we’ll observe traces of the past, examine the present woodland ecosystems and search for evidence of present inhabitants especially deer and other mammals. We can park at the start of Old Mill Road, alongside the church. Let your feet do the walking while we do the talking on this fast-paced outing. This morning "The City Birder" blog just passed the 250,000 hits mark! WOO HOO! Thanks for stopping by as often as you do. Hopefully, I'll be able to keep going for another 1/4 million visits. Greetings. This is the New York Rare Bird Alert for Friday, April 15th 2011 at 10pm. The highlights of today's tape are VARIED THRUSH, YELLOW-THROATED WARBLER, BLACK RAIL report, WHITE-WINGED CROSSBILL, KING EIDER, RED-HEADED WOODPECKER and Spring migrants. The Central Park VARIED THRUSH, still present today, has birders wondering how long it will stay though it is still being enjoyed as it spends more time now just north of the 79th Street transverse and south of the museum than it does around the maintenance area on the south side of the transverse. The RED-HEADED WOODPECKER also remains around the 66th Street park transverse south of the Sheep Meadow. But Central Park, like other city parks, is also producing an increasing number of Spring migrants. Species appearing now include GREEN HERON, YELLOW-BELLIED SAPSUCKER, NORTHERN ROUGH-WINGED SWALLOW, BARN SWALLOW, BLUE-HEADED VIREO, HERMIT THRUSH, BROWN THRASHER, HOUSE WREN, both kinglets with the RUBY-CROWNED KINGLET replacing GOLDEN-CROWNED KINGLET, BLUE-GRAY GNATCATCHER, PALM WARBLER, PINE WARBLER, BLACK-AND-WHITE WARBLER, CHIPPING SPARROW and SWAMP SPARROW. But the surprise in Central Park was a male BOAT-TAILED GRACKLE, photographed last Saturday in the north end of the park at the Meer. SPOTTED SANDPIPER was also noted in Central Park and some LOUISIANA WATERTHRUSHES are being found in the area. Certainly the warbler of note however this past week was YELLOW-THROATED WARBLER appearing in 4 different New York City area parks. First, a Yellow-throated was spotted last Sunday and Monday in Brooklyn's Prospect Park. This was followed by a Yellow-throated Tuesday at Wolfe's Pond Park on Staten Island and another at Alley Pond Park in Queens on Wednesday. Hempstead Lake State Park produced a fourth Yellow-throated on Thursday near the lower parking lot and also on Thursday the same, or another individual in Prospect Park, was found near the Maryland Monument. Neither of Thursday's Yellow-throateds were seen today. Other Prospect Park arrivals have featured PRAIRIE WARBLER, BLACK-THROATED GREEN WARBLER and INDIGO BUNTING. A NORTHERN PARULA was in Kissena Park in Queens Tuesday and Hempstead Lake State Park has also produced WHITE-EYED VIREO and BLACK-THROATED GREEN WARBLER. In Forest Park Queens a LOUISIANA WATERTHRUSH at the waterhole last Sunday joined 5 RUSTY BLACKBIRDS hanging out there. Recent arrivals at the Oceanside Marine Nature Study Area featured YELLOW-CROWNED NIGHT-HERON, CLAPPER RAIL, LESSER YELLOWLEGS and SEASIDE SPARROW. At Jamaica Bay Wildlife Refuge herons have included a small number of TRICOLORED HERON and LITTLE BLUE HERON as well as YELLOW-CROWNED NIGHT-HERON and some FORSTER'S TERNS were back as of Sunday. On Saturday 2 NORTHERN GANNETS were in the bay south of the West Pond and it's worth noting that this species is not included on the refuge checklist. Two PECTORAL SANDPIPERS were reported at the bay Wednesday. A couple of nice surprises out on the Jones Beach strip Sunday featured a drake KING EIDER with about 10 Common Eider east of the West End jetty and 4 WHITE-WINGED CROSSBILLS present in pines at the east end of Gilgo. Other Sunday West End birds included a SEMIPALMATED PLOVER and about 12 PIPING PLOVERS along the beach, an immature ICELAND GULL seen heading east and a few FORSTER'S TERNS. A VESPER SPARROW was reported from Uplands Farm Sanctuary in Cold Spring Harbor on Wednesday. This season's first BROAD-WINGED HAWK passed by Hook Mountain in Rockland County on Thursday. Thirty-three NORTHERN GANNETS and 3 RED-NECKED GREBES were off Playland Park in Rye this morning. But the week's most unusual report certainly involved a BLACK RAIL, not terribly well seen before flying off into adjoining marsh from a dried phragmites patch near the Hommocks School in Larchmont Westchester County last Sunday. The bird could not be relocated. Note: other birds will be pursued at the leader's discretion. Nearest train is the "R" train to 25th Street. Directions here. In early-April one can begin to see very distinct changes in the status and abundance of migratory bird species around NYC; blackbirds are continuing to increase in numbers, tree and barn swallows are arriving at annual nesting sites and wading birds are appearing around our ponds, lakes and marshes. 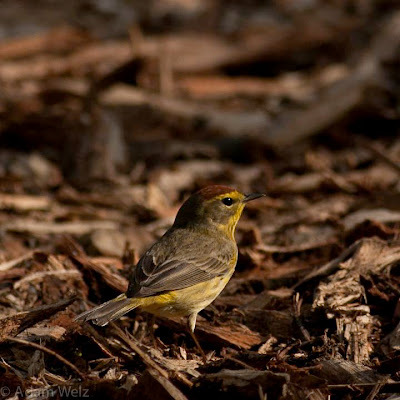 Warblers flocks have yet to make a full assault on our woodlands, however their numbers have certainly increased. Two weeks ago the first Pine Warblers began appearing throughout the city. Last weekend their numbers increased noticeably and they were joined by small flocks of Palm Warblers and Yellow-rumped Warblers. Early-April is also a good time to look for a rare southern warbler - the Yellow-throated Warbler. New York City is just north of this colorful bird's normal range, but periodically individuals will overshoot their destination and end up delighting birders lucky enough to find them. This past Sunday Heydi and I met in Prospect Park at sunrise hoping to find some early migrants. The winds had been coming from out of the south the previous day, so I was pretty certain that we would find some newly arrived birds, I also thought we should be on the lookout for Yellow-throated Warbler. Sunrise was at 6:20am and I had plans to be in the city before noon, so that gave me a good couple of hours to scour the park. The most noticeable change in the park's birds was an abundance of Brown-headed Cowbirds. The males of this species is an attractive, glossy blue-black bird with a metallic brown head. Their song isn't very melodic to my ears, but rather a mechanical series of whistles and gurgles. Some birders dislike the cowbird because they are parasitic brooders, that is, they lay their eggs in a host specie's nest when nobody is looking. The foster parent raises the young, usually to the detriment of their real offspring. 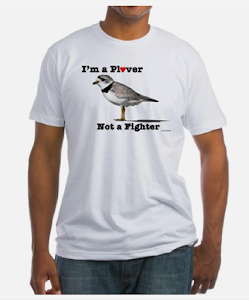 This has negatively impacted the populations of several woodland songbirds. I don't hold it against the cowbird because, afterall, it is the humans who cleared most of the forests, making them accessible to this species. "YELLOW THRTED WARBLER @ well dr n lake dr. by playgrnd"
I had just returned from the city, kicked my shoes off and was lying on the sofa. When Robin heard my phone chime, she yelled, half-joking, "Bird Alert". I read the first three words of Peter's message and said, "I gotta go. See you in a half hour". I pulled my bike down off the rack, strapped my helmet on, grabbed my bins and bolted down the stairs with the bike slung over my shoulder. I made it down to the edge of the lake across from the playground in 5 minutes. Eddie Davis was walking near the lake, scanning the tree tops. When I caught up with him, he explained that he had first spotted the warbler near the Vanderbilt Playground, but that it had flown over toward the lake. After a few minutes it headed back in that general direction, but he had been unable to relocate it. Crap. I started to scan the upperstory for trees that had flowered, reasoning that where there are flowers, there will be insects to eat. A couple of minutes later Russ joined the search. While scanning the trees on the opposite side of the road, I spotted Rob hustling our way. Then I spoke to Shane. He and Heydi were at Coney Island birding, but got the word and were headed to Prospect Park. A few minutes later, Peter and Mary arrived. 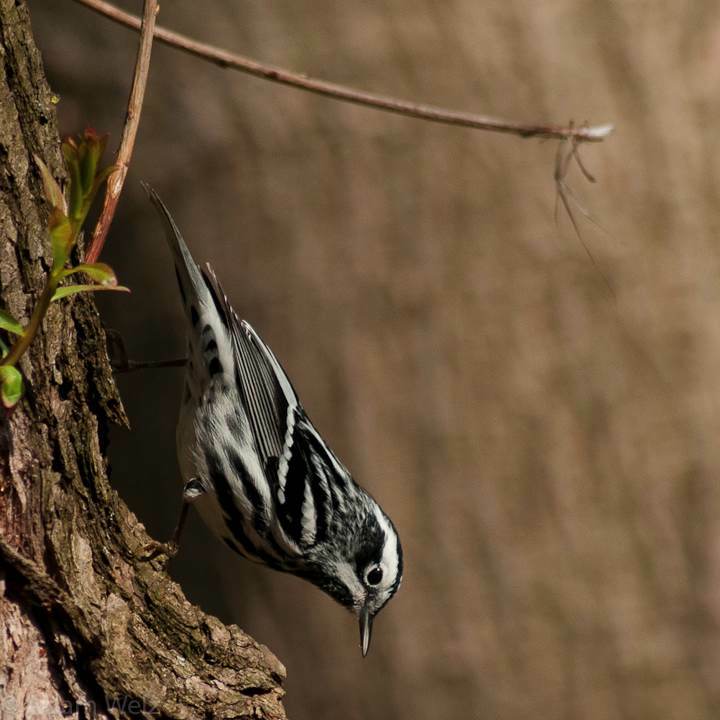 Eddie mentioned that when he found the Yellow-throated Warbler that it was foraging with a pair of Pine Warblers. I decided to look for the pines. Crossing back over to the start of Wellhouse Drive, I slowly made my way towards an area at the base of Lookout Hill nicknamed "lamppost J249". A Pine Warbler was chipping while it moved through a River Birch looking for insects. There was another near lamppost J249. A third bird flew across my field of view. It was the yellow-throated. Despite overcast skies, the bird's brilliant patch of daffodil yellow throat feathers beamed. The bird was moving a lot and creeping up and down the trunks of trees and branches like a nuthatch. It took a few minutes but eventually Russ, Rob, Eddie, Peter and Mary got on the bird. Shane and Heydi got there so fast they seemed to have transported directly from Coney Island to the edge of Prospect Lake. John and Chouyan got the message and they arrived with their son in a stroller hoping to see this rare Brooklyn warbler. They did. The spectacle of a group of people running around, feverishly searching the treetops and speaking to each other in, well, bird-speak, must seem silly or baffling to non-birders. At one point, I stopped watching the warbler to observe several people who had been checking us out and scratching their heads. I'm betting that if they had even a brief glimpse of this vibrant, 5 1/2" long songbird they would understand our excitement. 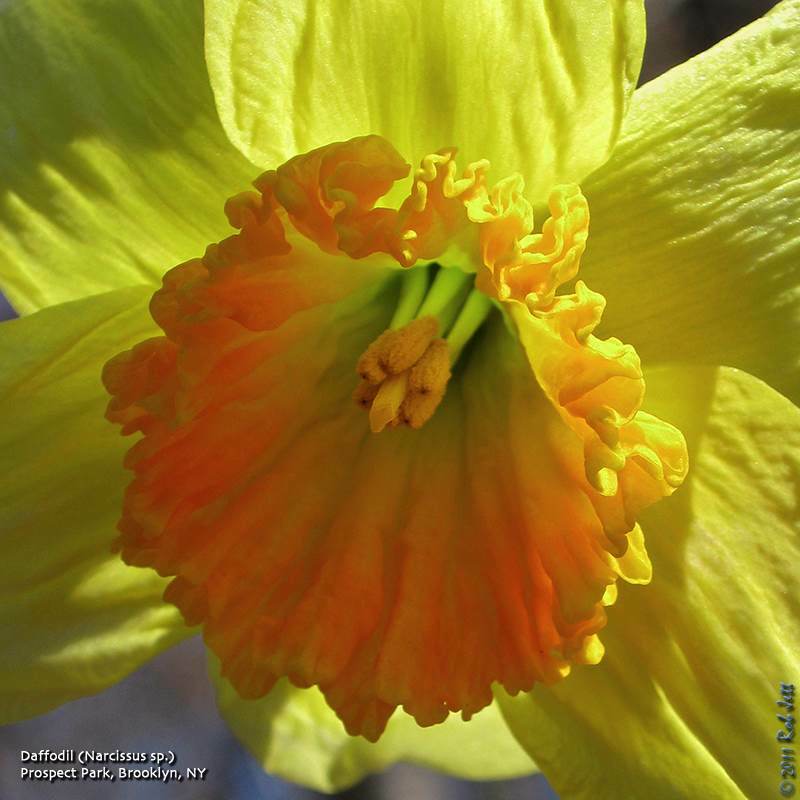 One definitive sign that Spring has arrived in New York is that daffodils are now in full bloom throughout the city. Daffodils are in the narcissus family and according to the American Daffodil Society, "there are between 40 and 200 different daffodil species, subspecies or varieties of species and over 25,000 registered cultivars (named hybrids) divided among the thirteen divisions of the official classification system." 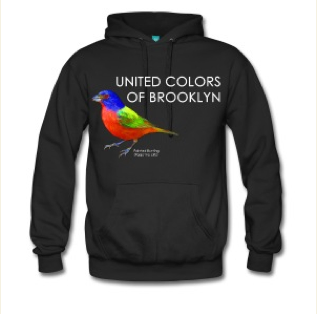 I just created another Brooklyn raptor T-Shirt for my online stores. 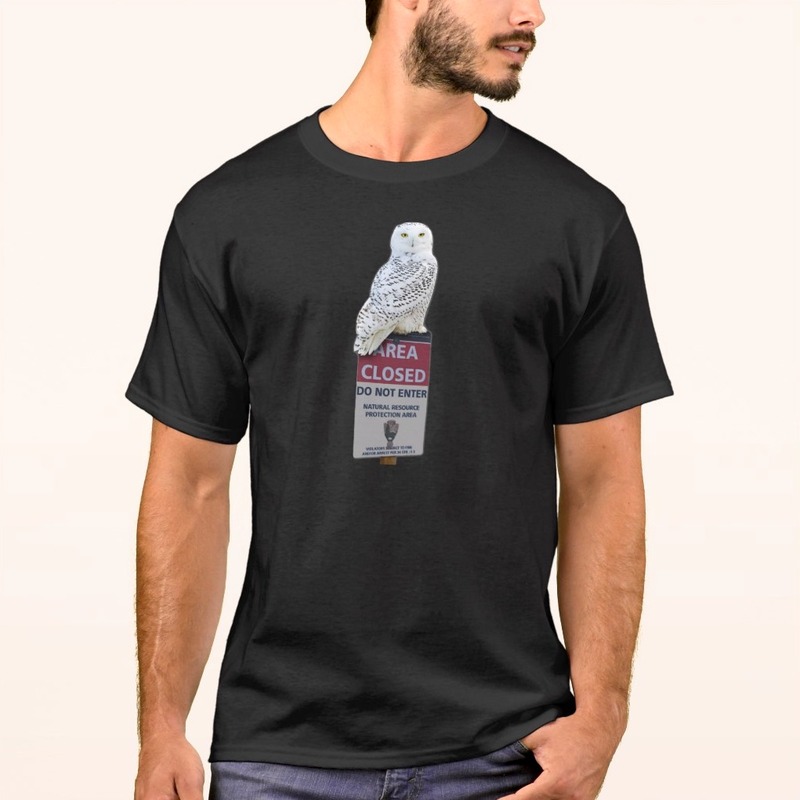 This one features our resident Great Horned Owl. You can view my full line of products from this blog here, visit my CafePress page or my new Zazzle page. Larry Z. is one of Brooklyn's regular birders in Prospect Park and other local hotspots. 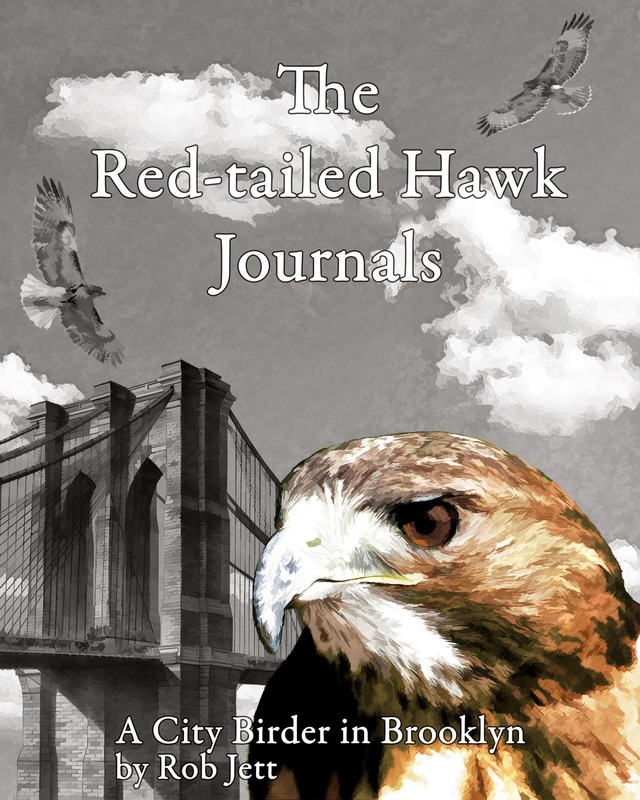 He blogs about his birdwatching adventures on "Birds and Words". Half of the world's Mangroves have been destroyed. Why should it matter? "Japanese tsunami reaffirms need for mangroves"
"The threat of damage and destruction from tsunamis and cyclones can be minimised to a great extent if the existing mangrove forests are protected and more trees are planted along the coast, said officials of the IUCN at the World Conservation Union on Tuesday." Saturday, April 16, 2011, 10:00 a.m. to 2:00 p.m.
Meet in the Nevada Avenue parking lot at High Rock Park. If you arrive late, walk to the first bend of the entry road, follow the Yellow Trail to Moses Mountain and take the unmarked trail to the right toward SeaView where we will be removing invasive vines that strangle or pull down shrubs and saplings. If you don't have your own, Protectors will supply pruners, gloves and refreshments. After a two hour work session (our 178th consecutive monthly workshop), we will take a short walk over nearby trails. Sunday, April 17, 2011, 9:00 a.m. to 11:00 a.m.
Spring trees are flush with newly hatched insects which help nourish countless numbers of birds flying to breeding areas up north. Clove Lakes Park offers views of these passerines without the need to strain one’s neck to look in the canopy. From atop the valley of Clove one can look down at the birds busy feeding in the treetops. Meet on the Martlings Avenue bridge. Greetings. 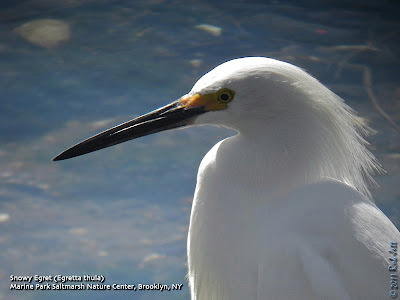 This is the New York Rare Bird Alert for Friday, April 8th 2011 at 9pm. The highlights of today's tape are VARIED THRUSH, GLAUCOUS GULL, ICELAND GULL, HARLEQUIN DUCK, RED-HEADED WOODPECKER, ORANGE-CROWNED WARBLER and Spring migrants. A little burst of migrants this week indicates that Spring will come after all. In Central Park the lingering VARIED THRUSH was, as of last weekend, still moving about between the maintenance area just south of the 79th Street transverse and the south side of the Metropolitan Museum of Art closer to 5th Avenue. While the slowly changing RED-HEADED WOODPECKER was still south of the Sheep Meadow recently. The Rambles feeder last Sunday were 2 COMMON REDPOLLS presumably heading back north. Most emphasis now has centered around tracking down Spring arrivals. One of the better local sites in early Spring for this is Hempstead Lake State Park where an ORANGE-CROWNED WARBLER found last Sunday was still present at least to Wednesday. Other warblers there featured PINE WARBLER, PALM WARBLER with a BLACK-AND-WHITE WARBLER Wednesday and a BLACK-THROATED GREEN WARBLER Thursday plus growing numbers of YELLOW-RUMPED WARBLERS. In addition a WHITE-EYED VIREO appeared Wednesday, a BLUE-HEADED VIREO Thursday along with a BLUE-GRAY GNATCATCHER. Swallows over the ponds there on Thursday included NORTHERN ROUGH-WINGED SWALLOW, BARN SWALLOW and CLIFF SWALLOW as well as TREE SWALLOW and the park has also featured other interesting birds including WOOD DUCK and RUSTY BLACKBIRD. Another arriving warbler was a LOUISIANA WATERTHRUSH in Brooklyn's Green-wood Cemetery Wednesday. EASTERN PHOEBES are now quite widespread and numbers of most of these migrants should increase quickly with others joining them. Different arrivals at Jamaica Bay Wildlife Refuge joining the egrets there featured LITTLE BLUE HERON and GLOSSY IBIS as of Thursday along with BLUE-WINGED TEAL one of which was also in Alley Pond Park last Sunday. Out at Point Lookout last Saturday the immature ICELAND GULL and 8 HARLEQUIN DUCKS continued around the jetties and the barrier beach produced some expected migrants during the week. NORTHERN GANNETS continue on western Long Island Sound and 10 were counted Thursday in Little Neck Bay. Moving east on Dune Road west of Shinnecock Inlet a SHORT-EARED OWL was still present Thursday and a few COMMON EIDER and a decent number of NORTHERN GANNETS were around the inlet. The immature GLAUCOUS GULL was still frequenting the area around the Orient Point ferry terminal last Sunday. Interesting for Westchester County was a male BOAT-TAILED GRACKLE singing at Marshlands Conservancy in Rye last Saturday and a good flock of 30 GREATER YELLOWLEGS there today is an indication that shorebirds are also on there way north. To phone in reports on Long Island, call Tony Lauro at (631) 734-4126, or during the week except Sunday call Tom Burke at (212) 372-1483.